I was delighted when the renowned garden photographer Clive Nichol came to the garden to capture images of David Harber’s ‘Volante’ sculpture. Here are some photos by landscaper and photographer Filip Koziel, which show how the garden is developing. It’s been a challenging summer for newly planted gardens, but I think this one is settling in perfectly! 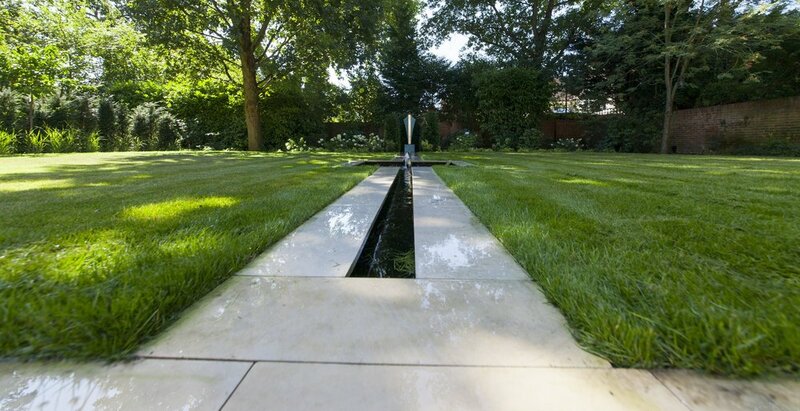 The Rill bisects the main lawn. The pond with bubbling fountain attracted toads throughout the dry summer, and we had to add ‘toad ladders’ so they could get out. Looking back towards the spacious terrace. The four Obelisk beds form a backdrop for the client’s portrait photography. 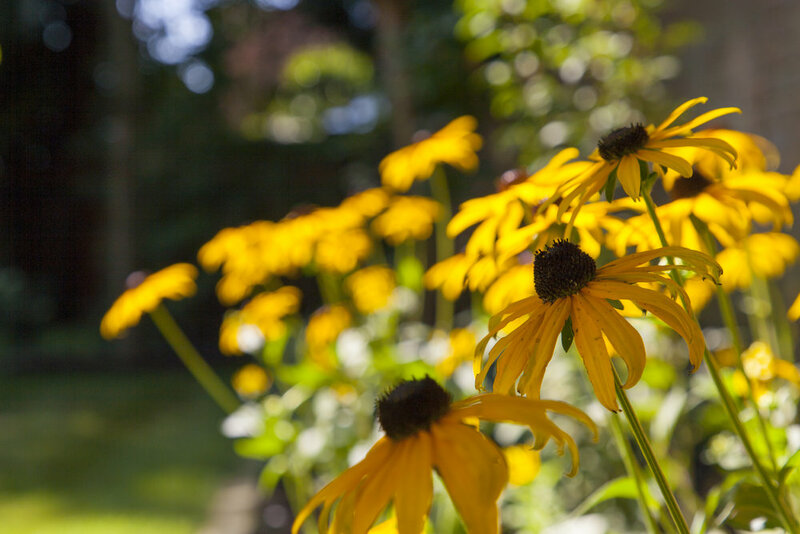 Glorious gold colours from Rudbeckia ‘Goldsturm’ light up the late summer garden. Hydrangea ‘Limelight’ and golden Hakone grass light up the shady areas of the garden. Hibiscus ‘Bluebird’ and a few late wisteria flowers. Acer leaves and trellis shadows. I have had several messages about this pest which devastates box plants. It has no predators and will quickly eat all the leaves on your carefully tended plants. The weather this year has produced a bumper crop of butterflies and moths, which I've welcomed into my garden. 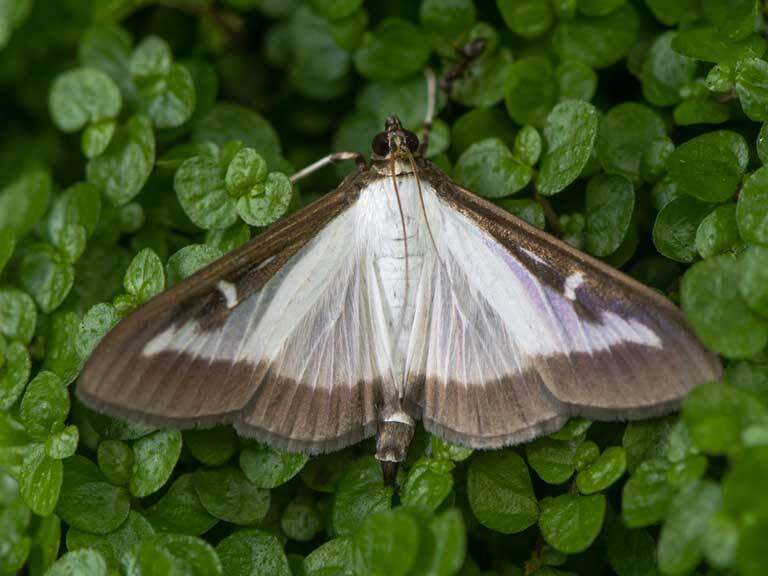 However this unwelcome moth variety appeared to produce it's caterpillars overnight, and they quickly munched their way along my box hedges and my box spheres and pyramids. The first image shows the difference between my affected and unaffected box plants. I hate to use insecticides, but I have found a product that only targets Box Tree caterpillars. I thoroughly sprayed the little devils as directed, and 2 weeks later have seen no further evidence. The neighbours must think I'm very odd: peering into my little hedges on a regular basis! As soon as I see any more, I'll spray again. The plants should recover and already show some signs of leaf growth. I'll be watching carefully! It is always a pleasure to see my gardens in all seasons, and here is a recent on-going landscaping project in Surrey. The garden still needs to be planted, but for now it looks beautiful. All my gardens seem to gain a nickname. The 'Wow! garden' was named after a request from my client. She wanted a garden that had a 'Wow factor' when seen from the French windows, and the name stuck. The 'before' images show a garden with a myriad of pots that contained beautiful Hostas, Heucheras and Roses that cried out to be planted in the borders. The brief included a generous dining terrace, a sunken lawn, a gravel seating area in the sunniest part of the garden, and increased privacy. A knowledgeable gardener, my client had a list of 'must have' plants, including Clematis, Acers, a multi-stemmed silver birch and scented trachelospermum jasminoides ( the evergreen Star jasmine), along with Hydrangea 'Limelight' and white Delphinium 'Galahad'. In the following photos, the garden had just been planted and I really look forward to seeing it again as it matures. I've just attended a morning hosted by Scotscape, who make and install 'Living Walls'. I am so inspired that I intend to have one in my own garden, to replace a large climbing evergreen, 'Hedera Lizei' which died this spring. It will be a 2m square panel, which will take almost 200 assorted plants. I can't wait to try it out so I can inspire my clients to have one too: it's beneficial to insects (particularly solitary bees) and has great health benefits, soaking up CO2 and atmospheric pollution. Last weekend was too wet to be out in the garden, so I created a succulent pot to sit on my garden table. I potted up four succulent plants in a mixture of potting compost, gravel and Vermiculite to ensure sharp drainage. They hate to have wet roots. Then I dressed it with more gravel to prevent the leaves getting wet and to set off the grey-green foliage. It can remain outside until the cold weather sets in, but then it will need frost protection until next spring. Succulents are having a 'moment' according to the gardening journals! One evening while I was enjoying a meal in my own garden, a previous client sent me these images of her own dining experience! Tags Here's the 'Before' image, taken following the new kitchen extension. A retirement bungalow, three years on. My client forwarded these lovely photos to illustrate her little courtyard garden. Quite a contrast from what we started with three years ago! It had been a bird-free zone despite the feeders, but now she watches as they constantly visit her plants and feeders. It's great to see this garden looking so different now that the new patio dining set has been added. I've shown 'before' photos as a contrast! It's hard to believe this is the same garden. It was overgrown and even dangerous, with a crumbling sunken area and a tangled mess of plants. Drainage was a problem, with frequent flooding into the garage. The brief included parking for up to three cars, but without looking like a car park. Some planting was requested, with a mixture of evergreens and ground cover. The final design used varied surfaces, including square and narrow grey pavers, and grey slate chips that could one day be planted. An alternative would be a large planter in the centre of the circle, perhaps with an olive tree. The cleverly graded slope, slot drains and soakaway beneath the slate circle solved the drainage problems. The chosen plants included a Sorbus (Rowan) tree that has cream blossom, pale pink berries and firey autumn foliage, several evergreen shrubs and easily maintained ground cover. The plants will soften the hard landscaping in time, leaving plenty of room for off-street parking. Here is a garden designed for a delightful house, one of several converted from an old factory. The house itself has a real atmosphere about it, and I wanted to add to the character of the place. The paving will have a traditional Yorkstone appearance, with gaps left for plants to self-seed, softening the look of the paving. There are several distinct areas, with a real 'Wow' factor as seen from the terrace. Two raised sleeper beds contain the client's beautiful Hosta collection, and a large olive tree under-planted with Lavender, Rosemary and Agapanthus. A further large and ancient olive takes centre stage further down the garden, with tall obelisks and mixed shrubs and perennials. The pond has a handy seat overlooking it, so you can watch the newts and dragon flies. Around the corner is a secluded dining area partially shaded by a black wooden pergola, referencing the black beams of the house walls. 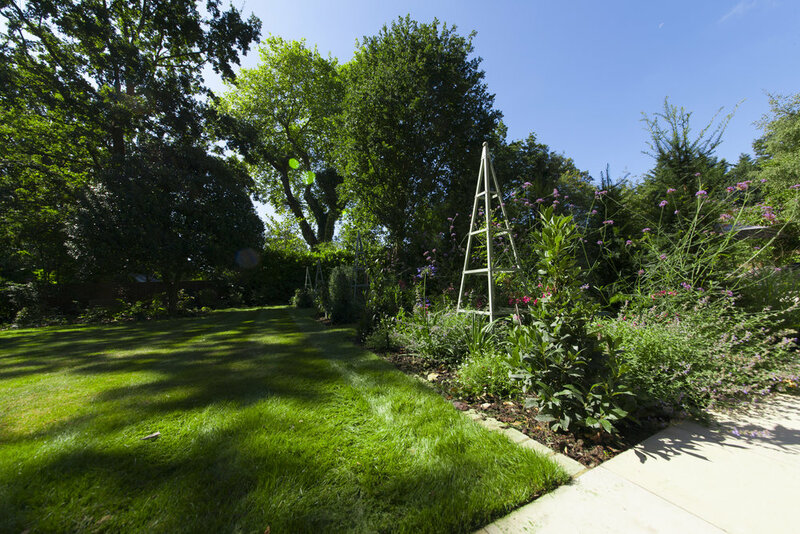 Steps lead down to the sunken lawn, with three tall Italian cypresses adding height and drama. At the end of the garden is a gravelled seating area, with an old stone urn and tin bath for colourful seasonal planting. The client is a passionate and skilled gardener, and I'm looking forward to planning the planting with her. Acers, grasses, Penstemons, geraniums, Brunnera, Astrantia........exciting! A new design for a large country garden. It's very satisfying to finish the graphics and illustrations for a new design. There's a kitchen garden, a contemporary garden studio, a generous patio and raised seating around a fire-pit. There's a special Acer border too. The garden is divided by a formal yew hedge, which acts as the perfect backdrop for flowering borders. Although there are already mature oak trees, I've added flowering cherry and crab apple trees for spring interest. Hellebore flowers are emerging from the ground now. It's time to cut the old leaves to the ground to allow them to show themselves to best advantage. Getting rid of old foliage also deters the fungal conditions that hellebores are prone to. 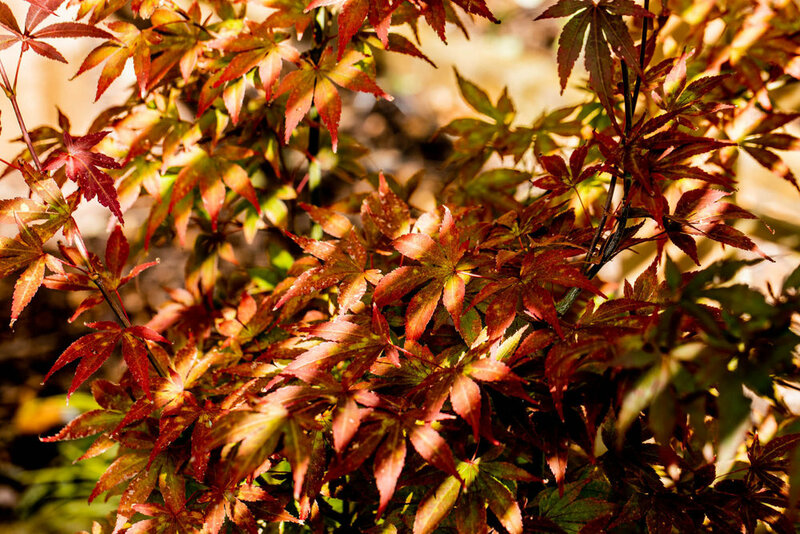 Bin or burn any affected leaves that show evidence of brown streaks or spots. The plants appreciate a mulch dressing later in the year, and a spring feed is beneficial. Having said that, I find that these are among the easiest of plants to grow in a shady site, and so welcome in January. There are many new selections that are bred to face upwards, and lots of lovely shades to choose from. They take a long time to grow from seed, and do not breed true. This is why they are fairly pricey in garden centres. But it's worth buying when in flower so that you can select the best colours. I find the sumptuous dark purple strains can get lost in the garden, so plant them against a lighter backdrop. One of the best new varieties on offer is 'Anna's Red', which will find a place in my garden this year. Taking care of my hellebores is one of my favourite winter tasks, and evidence that spring is on it's way. The brief called for screening from overlooking buildings, a large patio, a further dining area, a sunbathing area and a garden room. Lighting was important as the garden to be used for entertaining in the evening. A clean, contemporary look was achieved with porcelain paving, and raised beds planted with olives, lavender and grasses. There are black bamboos flanking the outdoor fireplace and in front of the white wall, adding texture, movement and screening. A large pergola adds privacy and is painted to match the large garden room. Horizontal trellis is an attractive backdrop to a mixture of evergreen and flowering shrubs, with plenty of ground cover perennials and spring bulbs. Lighting is used to highlight the eating and seating areas, and adds drama to the planting when viewed from the house. Tap or click onto the screen to scroll the images. Autumn continues to blow into my garden The leaves of Acers 'Katsura, and 'Golden Dream' look as good on the ground as they do on the shrubs, and Goosey Ghandi appears to be kicking through them on the lawn. My sculpture 'Far Horizons' wades through the golden grass Hakonechloa macra Aureola, and the sun catches the glowing reds of Acer Griseum and Bloodgood. There is something warm and lovely about wood carvings. These are on display at RHS Garden Wisley. If you haven't got room for a real horse in your garden, this could be the answer. And there is a lesson in garden design here: oversize any decorative pieces that you place outside.